seen by mortal man. Hardened adventurers have run screaming from the terrors contained within! searching for vast treasures long hidden from prying eyes, treasures guarded by fearsome monsters and diabolical traps! I wanted to play the next adventure game chronologically after the Crowther and Woods Adventure, but the history of mainframe games (on monstrosities like the PDP-10) is so murky it was difficult to tell what should come next. For one thing, the mainframe games did not have “release dates” — they were works in progress and in some cases earlier versions were more well-known than later versions. If it took 4 years to write something should I be using the end date or the start date? What if the later changes were only minor things dealing with source ports? Additionally, even with testimony from the original authors, memories are foggy about exact years (something Dennis Jerz struggled with in his Adventure article) and the early history of electronic games tends to the wildly inaccurate anyway. Fortunately, in 1985 the New Zork Times published a “History of Zork” which not only mentions not only years but months, so aside from one exception (which I will place next chronologically) it’s fairly clear Zork came next after Adventure. 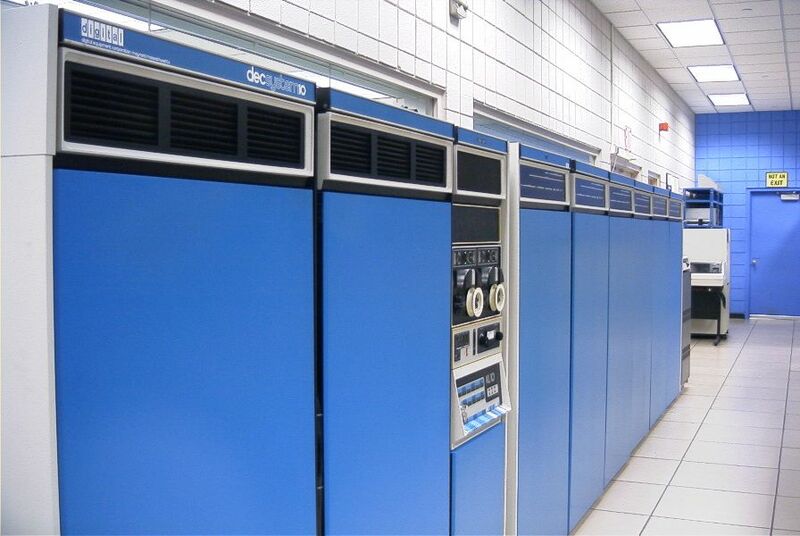 At any rate, shortly after the Great Blizzard of ’78 he had a working version, initially for PDP-11s. Since it was in FORTRAN, it could run on practically anything, and by now it has. Fortunately for us, a certain company (which shall remain nameless) decided to claim that it had trademark rights to the name Dungeon, as a result of certain games that it sold. We didn’t agree (and MIT had some very expensive lawyers on retainer who agreed with us), but it encouraged us to do the right thing, and not hide our “Zorks” under a bushel. Just like Adventure there’s a bevy of ports, but I’m going to go with one based off the original MUDDLE code (rather than the FORTRAN rewrite) into Z-code by Ethan Dicks called ZDungeon. I compared it with the mainframe version on Twenex and it is accurate enough for me to be happy. Actual gameplay will start in my the next post! 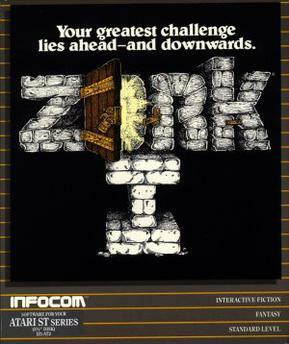 Just to clarify a bit of history: the mainframe Zork I am playing was too large a game for personal computers at the time, so when it went commercial it got split into Zork I, II, and III. Since I have only played the commercial versions playing mainframe Zork is like a fuzzy mash-up of my childhood memories. One thing I noticed (compared to modern games) with Adventure and now also Zork is that it is enjoyable to explore a wide open space; the feeling of world-immersion is strong even when many of the room descriptions are unassuming. You are in a clearing, with a forest surrounding you on the west and south. There is a pile of leaves on the ground. Modern adventures and interactive fiction tend to a tight room-structure, where no space is “wasted”. With a full enough immersion in the world-space I don’t believe rooms are necessarily wasted. 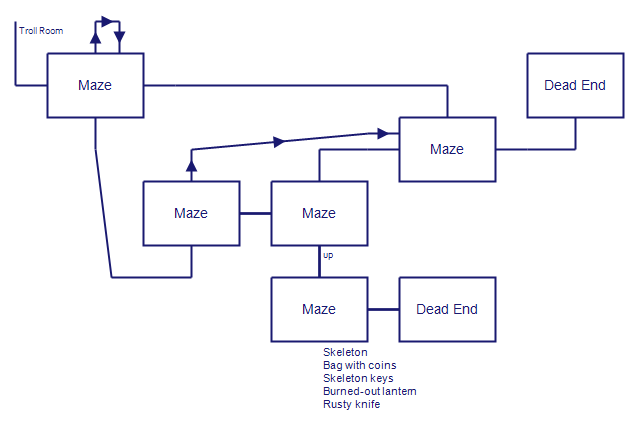 I’ll catch myself on that by saying I have experienced many adventure games where wasted rooms are both meaningless and painful (the worst offender I recall is Time Zone) and I can’t mathematize why Zork is different; just the amount of space feels right. Mapping with Trizbort is nice in that I can shift around whole sections to get the geography right. For example, there’s a “South Reservoir” that later connects up with a “North Reservoir”, so it’d be nice to have them in direct line with each other, but I had originally drawn the two areas all the way across from each other on the map. Just about a minute of cut and paste and everything was fixed. I suspect the general relationship of geography is important for at least one puzzle so I want to get it right. The first maze (there’s at least one more, and I hear there’s a third epic one later) has a cute tribute to Adventure. It appears the same intrepid explorer who got carried away by elves in triumph didn’t make it in the Zork universe. Incidentally, I’ve been picking up very little in the way of objects. The inventory limit is brutal, but interestingly enough it is based on object weight rather than exact number. It’s a nice touch of world-modeling which isn’t duplicated that often (I think?) in this era. The upshot is I’ve hardly started on puzzle solving at all. I do remember Zork I well enough that some parts will give me no trouble, but my Zork II and Zork III are quite foggy. There’s a rotating circular room that is driving me nuts. I presume there’s some way to stop it? I have forgotten how. I didn’t discuss Adventure‘s overall plot at all; there’s a true sense that there isn’t one. The entire task was of collecting treasures and storing them, and the “endgame” was tacked on in the same manner as a late-80s arcade game. That’s not to say there wasn’t a story — see for example my experiences in the maze playing a game of cat-and-mouse with dwarves — but this story was generated strictly from the system, and transplants into a (relatively) barren universe. OUT FROM THE SHADOWS BEHIND YOU POUNCES A BEARDED PIRATE! “HAR, HAR,” HE CHORTLES. “I’LL JUST TAKE ALL THIS BOOTY AND HIDE IT AWAY WITH ME CHEST DEEP IN THE MAZE!” HE SNATCHES YOUR TREASURE AND VANISHES INTO THE GLOOM. Someone carrying a large bag is casually leaning against one of the walls here. He does not speak, but it is clear from his aspect that the bag will be taken only over his dead body. The thief doesn’t just come out of the shadows, he is just there. The sword, which previously signaled danger by steps with a “faint blue glow” when an enemy is close and a glow “very brightly” when reaching the enemy, goes straight from dark to bright. The thief just leans against the wall — no visible signs of action — and you don’t notice your valuables have been removed until after he is already gone. You are at the top of the Great Canyon on its south wall. From here there is a marvelous view of the Canyon and parts of the Frigid River upstream. Across the canyon, the walls of the White Cliffs still appear to loom far above. Following the Canyon upstream (north and northwest), Aragain Falls may be seen, complete with rainbow. Fortunately, my vision is better than average and I can discern the top of the Flood Control Dam #3 far to the distant north. To the west and south can be seen an immense forest, stretching for miles around. It is possible to climb down into the canyon from here. YOU ARE ON THE EDGE OF A BREATH-TAKING VIEW. FAR BELOW YOU IS AN ACTIVE VOLCANO, FROM WHICH GREAT GOUTS OF MOLTEN LAVA COME SURGING OUT, CASCADING BACK DOWN INTO THE DEPTHS. THE GLOWING ROCK FILLS THE FARTHEST REACHES OF THE CAVERN WITH A BLOOD-RED GLARE, GIVING EVERYTHING AN EERIE, MACABRE APPEARANCE. THE AIR IS FILLED WITH FLICKERING SPARKS OF ASH AND A HEAVY SMELL OF BRIMSTONE. THE WALLS ARE HOT TO THE TOUCH, AND THE THUNDERING OF THE VOLCANO DROWNS OUT ALL OTHER SOUNDS. EMBEDDED IN THE JAGGED ROOF FAR OVERHEAD ARE MYRIAD TWISTED FORMATIONS COMPOSED OF PURE WHITE ALABASTER, WHICH SCATTER THE MURKY LIGHT INTO SINISTER APPARITIONS UPON THE WALLS. TO ONE SIDE IS A DEEP GORGE, FILLED WITH A BIZARRE CHAOS OF TORTURED ROCK WHICH SEEMS TO HAVE BEEN CRAFTED BY THE DEVIL HIMSELF. AN IMMENSE RIVER OF FIRE CRASHES OUT FROM THE DEPTHS OF THE VOLCANO, BURNS ITS WAY THROUGH THE GORGE, AND PLUMMETS INTO A BOTTOMLESS PIT FAR OFF TO YOUR LEFT. TO THE RIGHT, AN IMMENSE GEYSER OF BLISTERING STEAM ERUPTS CONTINUOUSLY FROM A BARREN ISLAND IN THE CENTER OF A SULFUROUS LAKE, WHICH BUBBLES OMINOUSLY. THE FAR RIGHT WALL IS AFLAME WITH AN INCANDESCENCE OF ITS OWN, WHICH LENDS AN ADDITIONAL INFERNAL SPLENDOR TO THE ALREADY HELLISH SCENE. A DARK, FORBODING PASSAGE EXITS TO THE SOUTH. Vivid, certainly, but adding to the story in only an immediate sense and not in establishing persistent background details and the feeling of a world history. First, a mea culpa: you do get a faint blue glow when the thief is nearby, but only in the original Muddle version and not in the ZDungeon port. It’s actually even more effective than the sword suddenly turning on: it happens more frequently, and it makes for more moments of teeth-gnashing. Paul O’Brian writes that “Dungeon wants nothing more than to see you fail” and I’m feeling the burn. I’ve developed a system over the years to give myself the best chance of solving adventure games; unfortunately my rate of hintless wins has not improved much. The only games I’d call “substantial” I beat with no hints at all were Countdown to Doom (1982) and Anchorhead (1998). Other than the “Beginner” level Wishbringer (1985) I haven’t beaten any Infocom game without hints. This works best if there’s a puzzle where all the systems are clear and it is just a matter of fitting the pieces together (like the troll bridge puzzle from Adventure) and worst when there’s some sort of in-game experimentation required (like not realizing an item is magic — that trident looks suspicious — and there’s no clue except for in-game manipulation). Sometimes I’ll miss the existence of items; for instance the fact the “grail room” had an actual Grail object that could be picked up strangely eluded me for some time. Absolute worst is when I miss a map exit exists. This can happen to me even on good, sensibly mappable games (I missed going up from the kitchen in Savoir Faire for something like an hour). One of my standing stuck procedures is to double check every room on the map and try every single direction — even if the room description insists there’s only one way out — just in case. Anyone have their own method? Last time I posted about my system for handling being stuck. I’ve become less stuck; here’s how my breakthrough went down. This is a room which is bare on all sides. There is an exit down. I remember being stumped at the time. I realize it’s likely an easy-in-retrospect thing, but WELL now seems obvious to me. some etchings on the walls. There is a passageway to the west. There is a wooden bucket here, 3 feet in diameter and 3 feet high. I could tell it was the bottom of a well (being prepared by the riddle) but the message stumped me, and while I could enter the bucket I couldn’t get the bucket anywhere (too large to pick up, and the rope didn’t attach). I considered anagrams: “Amiable Goop”? “Go Amoeba Lip”? I thought maybe “EL” was part of “WELL” but I couldn’t make more out of that. At this point I reached my Stuck post. After I made the lists of objects and puzzles, I printed them out so I could study them away from the computer. My playing has been very sporadic out of work/life necessity anyway; adventure games are interesting in they are one of the few computer game genres playable outside of the computer. It’s even possible to play while sleeping (I recall a few stories of people realizing a puzzle solve from a dream). Ah-ha! Somehow this insight was difficult from a computer screen, but it came easily on paper. However, I was still stuck. Here’s how my thoughts went: Does this help me any? I want to move the well. I guess the rope was futile, it’s a magic well. Maybe magic words or some such? I jumped back in the game, entered the well, and tried all variety of “magic” words. No luck, but as I was trying things out the thought sprung up: Well, how would a magic well work? It’d come up when there was water, right? Don’t I have water? There is now a puddle in the bottom of the wooden bucket. The bucket rises and comes to a stop. entrance to a room on the east, but it can be crossed easily. You are in the wooden bucket. This was truly a nice solve: not only did I unlock a bottleneck in the map, but there was a artistic confirmation of my original insight. I’m fairly certain the second insight would _not_ have come to me off the computer, even thought it was quite possible to finish the solve based on the project list. Somehow being in the world-verse led me to the correct revelation. I’m hoping thinking more about my stuck-unstuck process will improve my overall puzzle solving, and lead to theories to solidify what I consider “good” stuck and what I consider “bad” stuck. I’ve tried my third port of Zork (although I am sticking with the second for now), so I wanted to talk more about the versions that are out there. 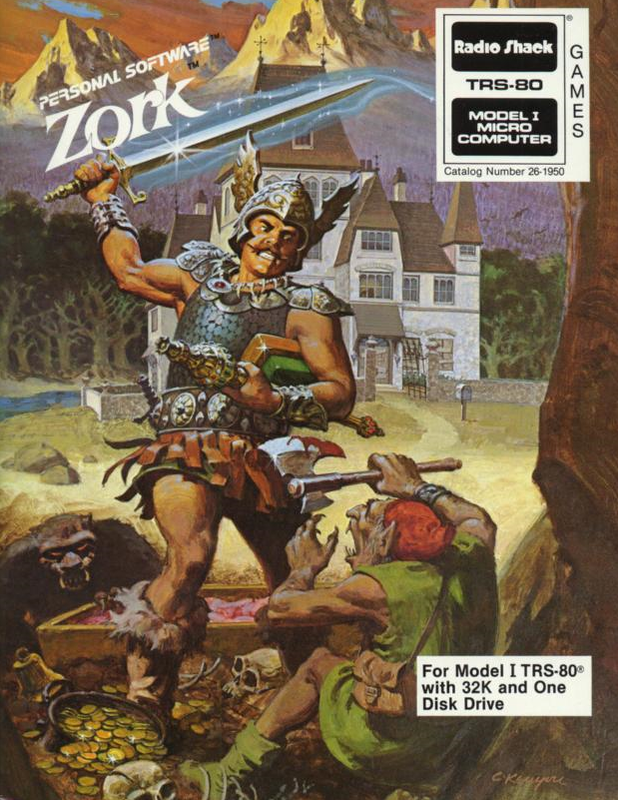 To recap an earlier post, the mainframe version of Zork started in 1977 a language called MDL, was ported in early 1978 to FORTRAN and renamed Dungeon, and was renamed again (due to trademark dispute) to Zork before it went commercial. The FORTRAN source kept getting modified by the original authors up until 1980 and the MDL source kept getting modified up until 1981. However, no versions from 1977 seem to exist (Dungeon 2.5, the earliest version number on if-archive, came from 1980) so any type of modern play will be several years removed from the original. In addition to looking easy on the eyes, it means I can SAVE and RESTORE and even UNDO to my heart’s content. However, David Kinder kindly pointed me to an interpreter called Confusion by Matthew Russotto that can play the MDL source directly. Since I’m tackling this project (which I have yet to name or define or admit exists) very seriously on the historical angle, I switched over. I noticed, as David Cornelson mentioned to me, the behavior of the thief seems different: the ZDungeon port has the thief appear in more rooms (any room?) and there’s no warning from the sword about thief proximity. So that aspect of the switch made me happy. You can’t do even that. I don’t think Confusion has bugs; I have the feeling these are “authentic” crashes in the code. I decided to try a Windows port derived from the FORTRAN source (I used the WinGLK one by Andrew Plotkin). unsatisfying afterlife, and a Last Lousy Point. I’m not sure what’s an “unsatisfying afterlife”, but additions of “several puzzles” definitely makes me nervous. Should that really be frowned upon? Am I playing for most enjoyable experience or maximum authenticity? Am I stalling by writing this post because yet another puzzle is stumping me? At least I know the answer to the last question. For a game with large landscape, many puzzles, and a harsh inventory limit, it’s essential to have a base of operations: a place to stash everything. One of my stopping points in Zork is that it’s been hard to find one due to the thief (who will keep treasures, and take non-treasures and drop them off at random spots on the map). I originally tried the Flood Control Dam #3, because it seemed to fit conditions a, b, and c and marginally d (it’s five rooms away from the Cellar and exit — once the trophy case has at least one treasure the trapdoor stays open) but I discovered that the thief does show up, he just doesn’t show his face; items in the room just start disappearing one by one. After fussing about some more, I noticed the Temple was also well lit, and lo (peeking at David Cornelson’s map to see if I missed anything on my map) there’s a very good source for exit to the surface and the thief also avoids the temple. So my progress has accelerated, although strangely I haven’t really solved much more; just I’ve been able to put together all the parts I’ve solved during individual runs on a continuous run.